Origin: This territory was first settled by Oliver Corey and other soldiers from the French wars, and known as Corey's Town. Oliver Corey was a grantee on the 1768 charter naming the town Saville. Another grantee, John Wendell, became a principal landowner, and the town was renamed Wendell in 1781 upon petition of residents. The name Sunapee was substituted for Wendell by the Legislature in 1850. Town, lake, and mountain share the name Sunapee, which comes from the Algonquin Indian words suna, meaning goose, and apee, meaning lake. The Indians called the area Goose Lake because it was a favorite spot of wild geese. Population Trends: Population change for Sunapee totaled 2,175 over 52 years, from 1,164 in 1960 to 3,339 in 2012. The largest decennial percent change was an increase of 67 percent between 1970 and 1980; the smallest, ten percent between 2000 and 2010. The 2012 Census estimate for Sunapee was 3,339 residents, which ranked 105th among New Hampshire's incorporated cities and towns. Population Density and Land Area, 2010 (US Census Bureau): 159.3 persons per square mile of land area. 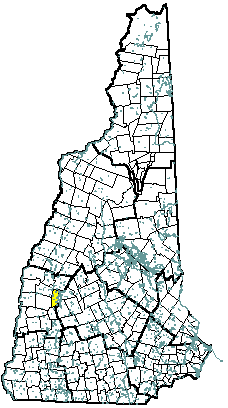 Sunapee contains 21.1 square miles of land area and 4.1 square miles of inland water area.